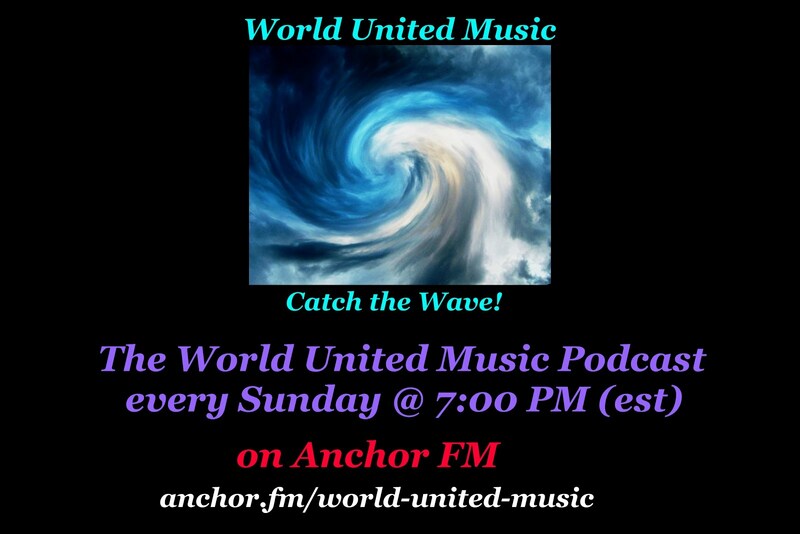 Amid increasing Israeli and Congressional pressure, the White House's desperate struggle to win international support to impose tough United Nations Security Council sanctions against Iran has forced the Western propaganda machine to move into high gear. The White House realizes that the campaign to persuade those that matter to adopt tough sanctions has hit a brick wall. 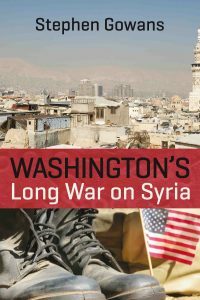 The efforts are based on the same old arguments: that Iran is going nuclear, that a nuclear-armed Iran would upset the balance of power in the volatile Middle East, that it would cause an arms race with Arab countries just waiting to beat each other in making atomic bombs -- Israel already has a nuclear arsenal, that Iran could provoke an all-out war if Israel sensed it could no longer live with the possibility that its arch foe would go nuclear one day; and they are falling on apathetic ears in China and, to a degree, in Russia. It is not that the Chinese, or the Russians, are not concerned by the notion that Iran could one day become the world's tenth nuclear-armed power -- a charge the Islamic Republic vehemently rejects. It is rather because the long lasting allegations against Iran seem to have been running their course as the world powers have failed to provide any compelling evidence to validate the claims in the past few years. Today, China, a permanent member of the UN Security Council with veto power, says dialogue is the only solution to the Iranian issue. Russia, another veto-wielding member, says sanctions are not "optimal" in dealing with Iran over its nuclear program. Iran is currently under three rounds of UNSC sanctions resolutions. As a signatory to the Nuclear Non-Proliferation Treaty (NPT), it says it will not yield to international pressure to abandon its rights to enrich uranium for civilian use. The sanctions, which Iran says are illegal, meanwhile, have failed, while proving troublesome at times, to force Iran to stop its enrichment work. The reality is that there are no evidence whatsoever that Iran is making nuclear bombs -- as if such proofs existed, the Israelis would have let the world know with much fanfare. The United Nations' nuclear watchdog, the International Atomic Energy Agency (IAEA), has said in many reports that its inspectors, who have been roaming Iranian nuclear sites for years, attest to the non-diversion of Iran's civilian program. The United States knows this; its allies, including Britain, also know this. But the White House is under Congressional and Israeli pressure to take action, and its allies have to follow suit. David Miliband, the British foreign secretary, warned in an op-ed for the International Herald Tribune that a war in the Middle East could be in the offing, arguing that if the international community failed to show "unity and resolve," Israel might feel compelled to attack Iran in an "act of self defense." He also went as far as claiming that, while stopping short of saying the future of humanity hanged in the balance, Iran was the most alarming problem the world faced today and that it needed to be dealt with by the means of sanctions or else. "Iran's nuclear program, and the world's reaction to it, raise the most profound questions about the strength of international law, the purpose of the United Nations and the rights of states that feel threatened by others. More prosaically, Iran's nuclear ambitions are a potential flashpoint for war in the Middle East," Britain's top diplomat wrote. I am not going to point out the flaws in Mr. Miliband's repetitive argument, but it seems to me that Western techniques are starting to lose their convincing power. Maybe they realize this too. 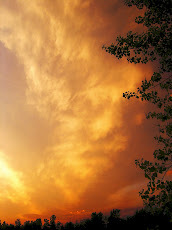 And maybe that is why a new case is starting to make waves on the horizon. 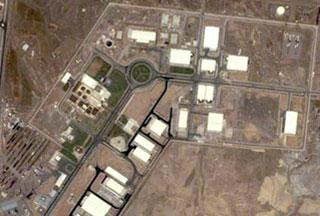 According to the New York Times, "officials of several governments and international agencies deeply involved in the hunt for additional nuclear sites in Iran" have said, in private, that the country may be moving to build new nuclear enrichment sites. The Times claims that there are "highly classified operations" underway in Iran to gather intelligence on the country's nuclear plans. 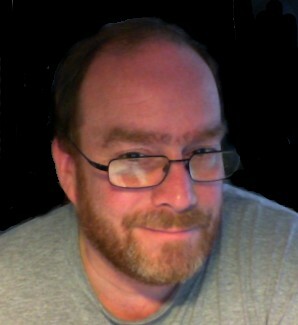 The article, by David E. Sanger and William J. Broad, makes a case that Iran is speeding up its nuclear activities, which ultimately lowers the time estimation given by American intelligence agencies that in the next one to four years, Iran may acquire the capacity to make atomic bombs, and that it is time for the international community to act on Iran; and adopt sanctions. The argument, which is based on a whole lot of hypothetical estimations, may sound realistic to some; but it could also be viewed from a different angle if the White House so chose to. Iran, an active member of the IAEA, has kept an open book on its nuclear work. It has even adopted the Additional Protocol -- the only measure that enables the UN agency to assert with absolute certainty that a country's nuclear program is exclusively for peaceful purposes -- for two and a half years. And the reward for it was the first round of UNSC sanctions resolution against the country. Iran, nonetheless, continued to keep a close cooperation with the agency. Last year, it informed the UN body that it was taking measures to build its second enrichment plant in Fordo, near Qum, southwest of the capital. The announcement was made in private. It, however, became public in September when President Barack Obama of the United States alleged that the Fordo site had been built in secret. With the allegation, the president hoped to get China and Russia on board for new sanctions -- an initiative which is yet to bear fruit. 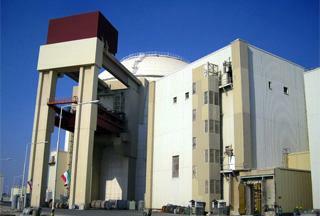 In November, Ali Akbar Salehi, Iran's top nuclear official, revealed in an interview that President Mahmoud Ahmadinejad had instructed the Atomic Energy Organization of Iran to begin pre-construction work on ten new enrichment sites, similar to the Natanz plant, which was for years used to enrich uranium to a level lower than five percent for nuclear fuel. 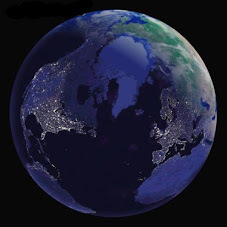 Meanwhile, the Times article said American officials, examining satellite evidence, have been unable to find clues as to where the new sites are being built. As if, no one in the American administration is keeping record on Iran's correspondents with the UN nuclear watchdog. Because if they did, they would know that the Tehran government, while abiding by its responsibilities to the NPT and the international community, would do all but to deliberately provide the West with a valid excuse over its nuclear program. They would know that Iran would inform the IAEA of its plans when the time is right -- eighteen months before construction on new sites begin -- and would then allow UN inspectors to set up monitoring stations in and around the facility. Nonetheless, the efforts to push for new Iran sanctions are meeting Chinese resistance. And the US administration is being forced to trim down its proposed list of sanctions on Iran's economy, the Islamic Revolution Guards Corps (IRGC) and the country's gasoline imports. And even if they manage to pass such punitive measures in the toughest format, they will be making an already complex situation much worse. Mr. Obama must look for a way to solve the problem at its roots, and that goal cannot be achieved unless his administration involves in effective negotiations with Tehran, accompanied by redoubled trust building measures. Arab leaders again resort to Washington to urge its closest ally Israel on halting settlement projects, ruling out 'peace talks' as long as settlement expansions continue. In a final statement after a two-day summit, the leaders stressed "their total rejection of the settlement policy carried out by Israel in the occupied Palestinian territories," calling on US President Barack Obama to pressure Israel to completely halt settlements. Israeli settlement policy poses "a dangerous obstacle to a just and comprehensive peace process," said the resolution of the summit held in the Libyan coastal city of Sirte. The two-day meeting was attended by 14 leaders of the 22-member Arab League, many of whom have already said they are convinced that indirect talks between the Tel Aviv regime and the Palestinians would end up nowhere. Earlier this month, the Israeli regime announced plans to build 1,600 new settlement units in annexed East Jerusalem al-Quds, viewed by Palestinians as the capital of a future independent Palestinian state. The announcement smothered US-sponsored "proximity talks" with the Palestinians, negotiations that had also enjoyed the backing of Arab leaders. Conditions further deteriorated when Tel Aviv fueled more tensions by reopening a synagogue close to the highly revered al-Aqsa Mosque in the Old City of East al-Quds, drawing wide-spread alarms of an Israeli scheme to demolish the occupied city's Islamic sites in an effort to Judaize the region. Qatari Prime Minister Sheikh Hamad bin Jassem bin Jabr al-Thani urged the global community on Friday to "accept its responsibilities." For the first time, he also called for international sanctions against the Israeli regime, which, al-Thani said "behaves as if it has immunity." The monitoring committee of the Arab peace has conditioned the resumption of peace talks to a freeze on Israeli settlement building and an immediate reversal of the decision to build 1,600 new settlement units. 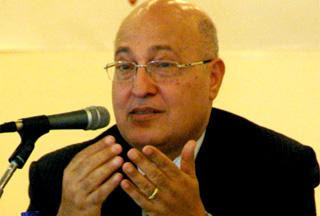 Hisham Yussef, a senior Arab League official, said there were several options for a new Arab strategy towards a defiant Israel. "Some talk of war, others talk of armed resistance or pacifist resistance," he said, also noting the alternative option of "going to the UN Security Council to get an agreement imposed on the parties." "It's time for the Security Council resolutions on the Israeli-Palestinian conflict to be dealt with under Chapter 7 of the UN Charter" that calls for more pressure when international peace is threatened, said Yussef. Palestinian officials warn that more than 20,000 Palestinian homes in Jerusalem al-Quds could soon face demolition orders from Israeli municipal authorities. Ahmad Ruweidi, the Palestinian Authority's legal advisor on al-Quds affairs, said Israeli courts will soon hand demolition orders to Palestinian homeowners over what Tel Aviv calls violation of construction rules over the past 10 years and the requirement of renewable licenses. The figure does not include homes whose owners have already received final demolition orders from Israeli courts or the Israeli municipality in al-Quds, Ruweidi noted. This means that all owners will live in a state of fear that at any moment their homes could be demolished or a family member may be found homeless on the street, he cautioned. Major differences between the Palestinians and Israelis are growing deeper over Tel Aviv's continued demolition of Palestinian houses in al-Quds and its efforts to create a demographic wedge in the region. On Saturday, acting Palestinian Authority Chief Mahmoud Abbas told delegates at the Arab League summit in Libya that Israeli settlements in the West Bank, in annexed East al-Quds in particular, remained the main obstacle to the resumption of the 'peace' talks. Abbas described al-Quds, which Palestinians have long been demanding as the capital of their future Palestinian state, as "the jewel in the crown as well as the door and the key to peace." "We emphasize that we hold onto every grain of soil and stone in Jerusalem (al-Quds). We are determined to defend Palestine's capital," he stressed. Israeli forces have crossed into the Gaza Strip while tensions remain high following Tel Aviv's Friday incursion into the Hamas-run Palestinian coastal enclave. Israeli soldiers moved around 500 meters (yards) inside Gaza on Sunday in several armored vehicles including bulldozers. Witnesses said the troops were predominantly targeting olive groves and almond fields in the Abasan al-Jadida area east of Khan Yunis. They dug large trenches and fired warning shots to keep farmers away, but there were no reports of casualties. Sunday's incursion was close to the site where Israeli tanks, bulldozers and jeeps, backed by helicopters, carried out a strike late Friday damaging two houses and killing a Palestinian. Seven people were also wounded in the attack. In an earlier skirmish, two Israeli soldiers were killed and two others wounded. This is while Israel's Finance Minister Yuval Steinitz has threatened that Tel Aviv will "liquidate" Hamas sooner or later, adding that Israel may even launch a new offensive on the Gaza Strip. Israel launched a 22-day war on the coastal strip in December 2008, killing over 1,400 Palestinians, most of them civilians. The offensive also devastated a large portion of the impoverished territory's infrastructure and left thousands of Gazans homeless. Regional leaders meeting in Libya have been united in their condemnation of Israel's settlement activity in occupied Palestinian land. "We have to study the possibility that the peace process will be a complete failure," Moussa said in his opening speech to the two-day annual summit. The Arab League chief cautions that the so-called Middle East peace process may be “a complete failure”, calling on Arab states to seek other alternatives. 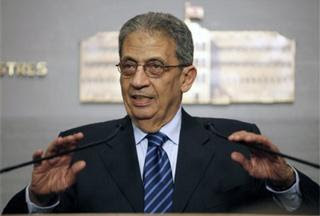 Amr Moussa's warning came on the first day of the Arab League Summit in the Libyan town of Sirte. UN Secretary General Ban Ki-moon, however, told the summit of Arab leaders that there would be no alternative to indirect “proximity” talks on a two-state solution. The two-day summit is being held amid Israeli plans to build new settlements in annexed Arab East Jerusalem al-Quds in defiance of international condemnations. “We have to study the possibility that the peace process will be a complete failure,” Moussa declared to the summit. “It's time to face Israel. 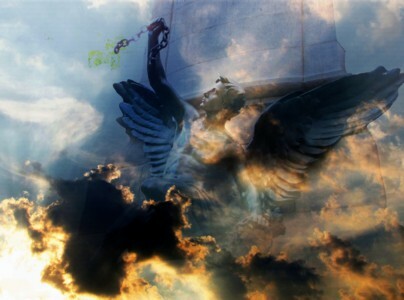 We have to have alternative plans because the situation has reached a turning-point,” he said. The Palestinians pulled out of the 'peace' talks after Tel Aviv announced plans to build 1,600 more settlement units in East al-Quds, which was occupied by Israel in 1967 — a move considered illegal under the international law. The 22-member Arab League plans to appeal to the International Court of Justice for an end to Israel's settlement expansion plan. The UN chief on Saturday urged Arab leaders in Libya to support indirect Israeli-Palestinian talks. "My message to you is that, whatever our concerns, there is no alternative to negotiations for a two-state solution," Ban claimed in an address at the opening session of the summit. "I urge you to support efforts to start proximity talks and direct negotiations. Our common goal should be to resolve all final status issues within 24 months," he added. Ban further reiterated that "settlement activity is illegal and must stop." His remarks come a day after Israeli Prime Minister Benjamin Netanyahu said Tel Aviv's policy on East al-Quds would not change. Observers point out that Ban's emphasis on continued talks with the Tel Aviv regime despite its defiance of the international community and even its own commitments is contradictory and a double standard. They add if the Israeli regime can defy the international community while the Palestinians are always demanded to make concessions, even on their basic rights, what sense does it make for the rest of the world to respect any UN decision? "This is madness and it does not commit us in any way," AFP quoted Erdogan as saying in a speech at the Arab summit on Saturday. "Al-Quds is the apple of the eye of each and every Muslim ... and we cannot at all accept any Israeli violation in the city or in Muslim sites," the Turkish premier added. The two-day summit hosted by Libya in its Mediterranean city of Sirte kicked off on Saturday to discuss a common strategy to stop the expansion of Israeli settlements in the occupied Palestinian land. The Arab League chief Amr Moussa has called for the freeze of settlement expansion in east Al-Quds as a crucial precondition for indirect peace talks between the Israelis and Palestinians. Speaking on the eve of an Arab summit in the Libyan city of Sirte, Moussa said Israel has to scrap its plans to construct 1,600 new housing units in the occupied city before indirect talks with the Palestinians can resume, AFP reported on Friday. Moussa however cautioned that the so-called Middle East peace process may be "a complete failure", calling on Arab states to seek other alternatives. 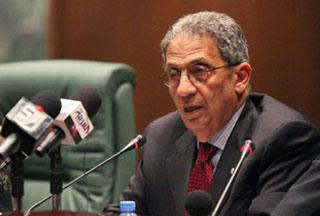 "We have to study the possibility that the peace process will be a complete failure," Moussa declared to the summit. "It's time to face Israel. 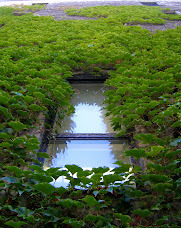 We have to have alternative plans because the situation has reached a turning-point," he said. Israel occupied Al-Quds during the six-day war in 1967 and later annexed it in a move never recognized by the international community. 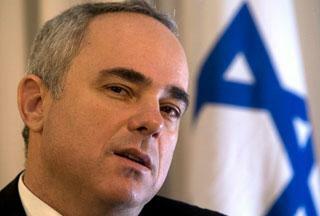 Israel's Finance minister Yuval Steinitz said Tel Aviv has not set a timetable for when it will eliminate the Palestinian movement, but he underscored that it would happen sooner or later. "American pressure isn't conductive and isn't fair, because the Netanyahu government made two enormous gestures toward the Palestinians: The opportunity to improve the Palestinian economy, and the settlement freeze," Haaretz quoted the Israeli minister as saying on Sunday. "The US needs to understand that the atmosphere it created in the Middle East, makes Washington now less friendly to Israel, and isn't making the Palestinians more willing to compromise; it further adds to their rejection of the peace process," he added. The Israeli minister's claims about Israel's settlement freeze comes as Tel Aviv announced plans to build 1,600 more settlement units in east Jerusalem (Al-Quds), which was occupied by Israel in 1967, a move considered illegal under the international law. The US federal government has targeted around 30 financial companies in new cases of potential fraud. 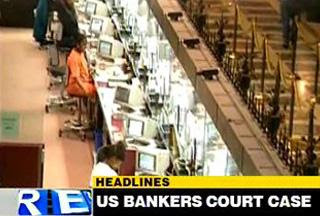 A US federal court is probing a criminal case involving 29 bankers with prominent financial institutes including Bank of America, JP Morgan Chase, Lehman Brothers, UBS, Wachovia Bank and Societe General which are suspected of co-conspiring in the pricing of certain municipal derivatives, Reuters reported. The issue of co-conspirators was mentioned at a court hearing on March 26 when a federal prosecutor and defense lawyers argued over a review of more than 125 million pages of documents and 670,000 audio tapes in evidence, the report adds. In 2006, the US Justice Department, Internal Revenue Service, and Securities and Exchange Commission launched a sweeping investigation into how certain derivatives had been priced. The investigation has gained momentum in the last few months as a number of counties and cities sued the companies involved. The number of Palestinians killed in the latest Israeli offensive into Gaza strip has reached to four. 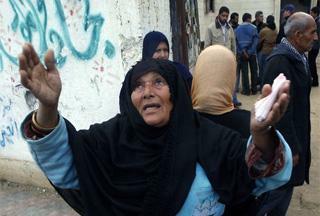 Violence erupted again after Israeli forces supported by tanks invaded the southern town of Khan Younis on Friday. Earlier reports said the incursion resulted in the death of two Palestinians and two Israeli soldiers. 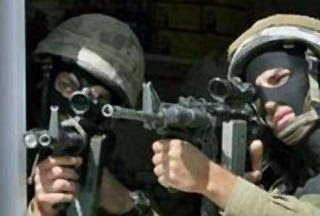 Two Israeli soldiers, including a high-ranking officer, were killed by Gazan resistance fighters during the incursion. Hamas' military wing, al-Qassam Brigades, has claimed responsibility for the Israeli fatalities. "We take the responsibility for the killing of the Israeli soldiers in southern Gaza. What happened shows that the al-Qassam Brigades are fully prepared to confront an Israeli aggression," Press TV correspondent in Gaza quoted Al-Qassam Brigades spokesman Abu Ubaidah as saying on Saturday. "We also want to dedicate this operation to the soul of our late commander Mahmoud Al-Mabhouh who was assassinated by Israel's Mossad agents in Dubai," he added. The violence added to the strain on Israel, which is already under pressure from the international community over the expansion of its settlements in occupied Palestinian land. European Union foreign affairs chief Catherine Ashton said she was "extremely concerned" by the latest violence and called on both sides to exercise restraint. "Such actions undermine current efforts to facilitate a resumption of the peace process," AFP quoted Ashton as saying in Brussels. Search and rescue efforts are continuing for 46 South Korean sailors missing after their naval ship sank off a disputed border with North Korea. According to a South Korean military official, the 1,200-tonne Cheonan was on a routine patrol in the Yellow Sea near the South Korean-controlled Baengnyeong Island on Friday when it started to sink. South Korea's Yonhap news agency quoted officials as saying that an explosion inflicted severe damage on the ship, taking it down quickly. So far, at least 58 out of the 104 crew members on board are reported to have been rescued. While Seoul has ruled out any indications that Pyongyang had been involved in the incident, it says the cause of the event remains unclear. Immediately after the sinking, South Korean President Lee Myung-bak convened an emergency meeting of security officials, urging them to investigate all possible reasons behind the event. However, he ordered the military to focus on rescuing the sailors. 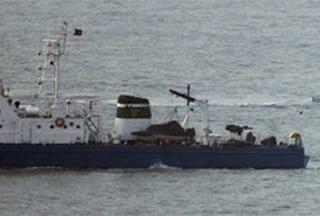 Some reports on Friday claimed that another South Korean ship had fired shots at an unidentified vessel to the North after the Cheonan began to sink. Government officials have denied the story. Tensions have been running high on the Korean peninsula following the North's accusation that the South is attempting to oust Pyongyang's government. North and South Korea are still in an official state of war since the 1950-53 Korean War ended in a truce. South Korea recognizes the Northern Limit Line, drawn unilaterally by the US-led United Nations Command at the end of the war. North Korea, however, has never accepted the borderline. Pakistani Interior Minister Rehman Malik says the US drone attacks in the tribal areas along the border with Afghanistan are carried out without the consent of Islamabad. Speaking to reporters outside the Lahore High Court non Friday, Malik said the controversial issue of US drone attacks was to be raised with Washington during bilateral talks. The remarks come as Washington claims the raids target militants in Pakistan. 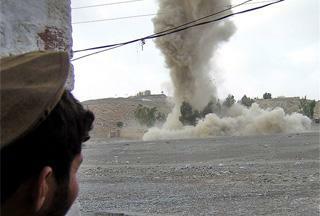 However, hundreds of civilians have fallen victim to such US drone attacks since 2008. Islamabad has repeatedly condemned the strikes, saying that they infringe the country's sovereignty and fuel public anger. Earlier on Thursday, Pakistani Foreign Minister Shah Mehmood Qureshi, who was in Washington for high-level talks, criticized US forces for launching drone attacks on Pakistani soil. "The issue of sovereignty is there. People of Pakistan feel strongly about it," Qureshi told CNN. full preliminary results from Iraq's recent parliamentary elections point to the victory of the coalition led by former premier Iyad Allawi over its main rival and incumbent Prime Minister Nouri al-Maliki. Securing 91 seats in the 325-member Council of Representatives, two more than those won by Maliki's State of Law coalition, Allawi's secular al-Iraqiya Alliance came victorious out of the March 7 elections, Iraqi electoral officials announced on Friday. More than 6,200 candidates from six major coalitions and several other tribal and ethnic minority groups vied for the parliamentary seats on March 7, with Allawi and Maliki deemed as the main contenders. Prior to the announcement, Maliki supporters took to the streets, echoing the call by the premier and President Jalal al-Talabani who had requested recount of the ballots. 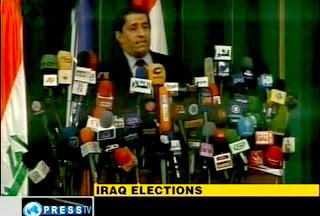 Maliki, meanwhile, says that the results are not yet final, AFP reported. This is while the United Nations representative in the country called the electoral process "credible" and a "success" and urged the candidates to "accept the results." Simultaneous blasts have rocked north of the Iraqi capital, claiming the lives of at least 42 people prior to the announcement of the preliminary results. Violence continues to take its toll on Iraqi civilians, nearly six years after the US-led invasion of Iraq. Some 136 attacks reportedly killed at least 37 people on Elections Day on March 7. Prior to the voting process, Iraq's senior Shia leader Muqtada al-Sadr urged the Iraqi electorate to help end the US-led occupation of the country by attending the polling stations. Moscow and Washington have agreed to reduce their nuclear arsenals to the promised levels in seven years as per new Russia-US strategic arms reduction treaty. 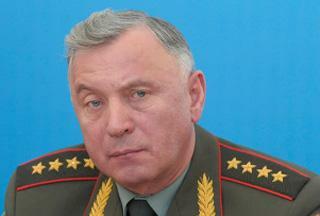 "The main result of the negotiations is a cut of more than 30% in Russian and US strategic offensive weapons. The treaty will have a validity term of ten years, and the established parameters are to be reached within seven years," Russia's RIA Novosti news agency quoted General Nikolai Makarov as saying. Under the new treaty, the number of nuclear warheads is to be reduced to 1,550 on each side. It also stipulates that strategic offensive weapons are to be based solely on the national territories of Russia and the United States. "The agreements lift mutual concerns and meet Russia's interests in full," Makarov said. The deal is to be signed by the presidents of Russia and the United States on April 8 in Prague. The signed deal has to be ratified by the parliaments of the two states in order to come into effect. The number of delivery vehicles, deployed and non-deployed intercontinental ballistic missile (ICBM) launchers, submarine launched ballistic missile (SLBM) launchers, and heavy bombers equipped for nuclear weapons, must not exceed 800 on each side. US President Barack Obama quit a recent meeting with Israeli Premier Benjamin Netanyahu to have dinner in private after the latter failed to hand a written promise of concessions on Jewish settlements, reports say. The Tuesday meeting was held amid an alleged dispute between the two allies over Tel Aviv's recent announcement that it would build a 1,600-unit settlement in the occupied East Jerusalem (al-Quds), Times Online reported on Thursday. US Secretary of State Hillary Clinton called the announcement — which came during a visit by US Vice President Joe Biden, aimed at promoting Israeli-Palestinian peace negotiations — a "deeply negative signal." The Israeli side was apparently expected to agree to halt its construction plans and settlement expansion ambitions in the occupied Palestinian territories, and extend a 10-month settlement freeze during the meeting. Netanyahu, however, "thought he had resolved the crisis by apologizing to Biden… and by offering partial, noncommittal answers to the Americans' questions," wrote Israeli daily Ha'aretz. Before leaving Netanyahu for dinner, Obama gave the Israeli premier time to consult with his advisers and change his mind. "Let me know if there is anything new," a US congressman who had spoken to the Israeli prime minister after the incident quoted Obama as saying to Netanyahu. The Israeli team was consequently permitted to stay in the White House but left for the Israeli Embassy over fears of being eavesdropped on by Tel Aviv's closest ally. 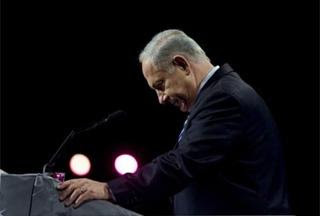 “The prime minister leaves America disgraced, isolated and altogether weaker than when he came,” Ha'aretz wrote. However, the reports on the purported confidence deficit in the bilateral ties are distrusted by analysts, who cite Clinton's recent impassioned pledge of allegiance to Tel Aviv after her condemnation of the Israeli settlement construction. 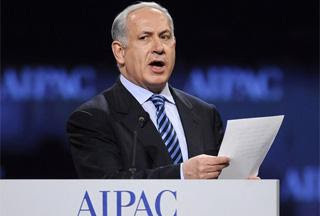 Addressing the annual conference of the major Israeli pressure group in the US, the American Israel Public Affairs Committee (AIPAC), the secretary of state reaffirmed Washington's strong ties with Tel Aviv and said "guaranteeing Israel's security is more than a policy position for me; it is a personal commitment that will never waver." Opponents of the theory, however, say that the Obama administration did not press hard on Israel during the AIPAC meeting, to avoid losing support for the healthcare bill among congressmen. "Unfortunately, the recent developments and comments made over the past few months by the officials of the Zionist regime (Israel), clearly show the seriousness of the occupiers' plot to give a Zionist identity to the first kiblah of Muslims," Mottaki said in a statement on Thursday. "This has raised the alarm for people across the globe and has highlighted the necessity of taking serious measures and maximizing potential in all Muslim nations,” the statement added. The Iranian minister said that the expansion of the Israeli settlements, the destruction of Islamic and Christian structures and the construction of new synagogues in Jerusalem (al-Quds) have unveiled the Israeli plot, "which, unfortunately, has been approved by Washington." 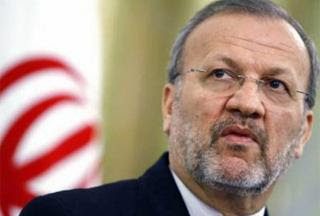 Mottaki warned that the Israeli plot will have "dangerous consequences." 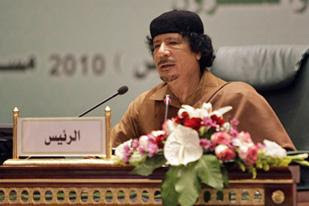 He urged Arab states to put the issue high on the agenda of the Arab League conference, which is underway in Libya. Mottaki also called for the formation of a committee consisting of the foreign ministers of the Arab League and the Organization of the Islamic Conference member states to discuss the latest developments in Jerusalem (al-Quds). 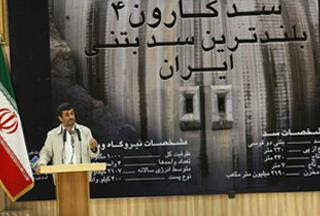 Iranian President Mahmoud Ahmadinejad has slammed Western governments for their unconditional support of Israel. "We don't want you to take a position against Israel; you cannot do that," he said, speaking at a ceremony at Shahrekord in central Iran for the inauguration of a hydroelectric dam across Iran's largest river, Karun. "There is not a single statesman in the West who is brave enough to stand up against these corrupt Zionists, who have dominated the European nations and the US, and humiliated them with such crimes." 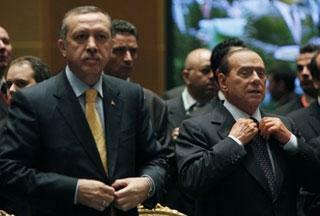 "There is not a brave statesman in the West. 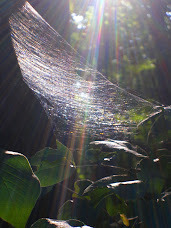 At least it seems so for the present. 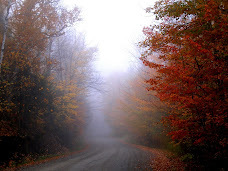 Maybe one will be found in the future," Ahmadinejad said. He did not however demand that the West have a turnabout and oppose Israel. “We lower our expectations," he said. "We don't want you to counter such crimes, although you are morally obliged to do so." Instead, he demanded objectivity from Western governments, and said, "[We want you to] remain neutral. Withdraw your support from these Zionists." He further said that Washington itself was part of the problem [in the Middle East conflict], because it has always been on Tel Aviv's side. Iran's representative to the UN seminar on Palestine says the Palestinian plight is a "global concern" which the international community must "urgently" address. Speaking at the two-day event in Vienna, Ali-Asghar Soltanieh said that the Palestinian issue was not simply a conflict between regional and Arab states and that the issue must raise concern on an international level. "The international community must take urgent action to restore the rights of the Palestinian people, the most basic of rights which they have been denied for over six decades," he told the participants at the gathering. The United Nations Seminar on Assistance to the Palestinian People, the theme of which is "Building institutions and moving forward with establishing the State of Palestine", opened at the UN headquarters on Wednesday. The aim of the gathering was garnering support for the Program of the Palestinian Authority entitled "Palestine: Ending the occupation, establishing the State". The organizers of the event also seek to attract much-needed international aid for Palestinians by raising awareness about their economy and the hardships they subject to because of the various limitations and blockades imposed by Israel. Citing the Goldstone report on the 22-day Israeli war on Gaza, the Iranian envoy condemned Tel Aviv's crimes against humanity and said Israel was able to conduct such inhumane activities because it has US support. He also condemned Israel's new decision to expand illegal settlements in the West Bank territories it has occupied, saying that Tel Aviv had no regard for international law. Earlier this month, during US Vice President Joseph R. Biden's trip to Israel, Tel Aviv announced that it would soon initiate the construction of 1600 units in the Ramat Shlomo housing development in East Jerusalem (al-Quds). More recently on Tuesday, Israeli website Ynet also announced that another East Jerusalem (al-Quds) building project was also underway, this time 20 units in the Palestinian populated neighborhood of Sheikh Jarrah. The UN Secretary-General has spoken out against the move and said that "all" Israeli settlement building in the occupied East Jerusalem al-Quds is illegal. "All settlement activity is illegal. But inserting settlers into Palestinian neighborhoods in Jerusalem al-Quds is particularly troubling,” United Nations Secretary-General Ban Ki-moon told the Security Council in New York. “This leads to tensions and undermines prospects for addressing the final status of Jerusalem,” he said. The UN chief says "all" Israeli settlement building in East Jerusalem al-Quds is illegal, as Washington and Tel Aviv apparent row over plans to build more units. "All settlement activity is illegal, but inserting settlers into Palestinian neighborhoods in Jerusalem (al-Quds) is particularly troubling,” United Nations Secretary-General Ban Ki-moon told the Security Council in New York, quoted by The New York Times. “This leads to tensions and undermines prospects for addressing the final status of Jerusalem (al-Quds),” he said. Ban's comments came as US President Barack Obama and Israeli Prime Minister continued their talks for a second day in Washington amid an unusual news blackout. "There are areas that they discussed last night, some of which they agree and some of which they disagree… The conversation was honest and straightforward," the White House press secretary told reporters. "The president has asked the prime minister for certain things to build confidence,” Robert Gibbs said, refusing to give any further details. The Palestinian side has maintained that Israel must fully withdraw from the territories if it is serious about peace. In a statement released on Wednesday, chief negotiator of the Palestinian authority Saeb Erekat said that with the new settlements Israel was "digging itself into a hole that it must climb out of, if it is serious about peace." Earlier this month, during US Vice President Joseph R. Biden's trip to Israel, Tel Aviv announced that it would soon initiate the construction of 1600 units in the Ramat Shlomo housing development in East al-Quds. While the prime minister was in Washington for talks with Obama, the Israeli website, Ynet, also announced that another East al-Quds building project was underway, this time 20 units in the Palestinian populated neighborhood of Sheikh Jarrah. 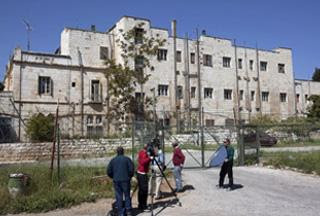 Israel plans to build the units on the site of Shepherd Hotel, the former home of the late Islamic law scholar Haj Amin Husseini. Contrary to UN's position, Netanyahu claims that Israel has the right to continue building in al-Quds. 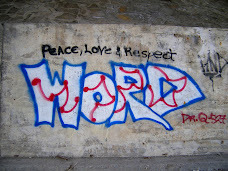 Latest news reports suggest that Obama has withdrawn from the position of asking Israel to stop settlement construction. According to a Washington Post article on Thursday, Obama has asked Netanyahu to ensure that housing projects in East al-Quds "do not spoil the atmosphere for talks." Netanyahu told reporters that he was hopeful of a compromise over the al-Quds settlement issue after his visit to Washington. Russia says it will go ahead with the inauguration of Iran's Bushehr atomic power plant despite growing opposition from the United States. Russian Foreign Ministry Spokesman Andrei Nesterenko made the remarks days after US Secretary of State Hillary Clinton warned that the launch of the long-delayed 1,000 megawatt plant would send Tehran the wrong message. The US and its allies have been trying hard to push through a fourth round of sanctions against Iran, while China and Russia have been reluctant to go along with the scheme. Nesterenko said, "Everything is being done under IAEA [the International Atomic Energy Agency] regulations" and "spent fuel deliveries to Iran will be returned to Russia with the IAEA's seal according to the standards of all the existing technology in this field." Russia says it will put the nuclear reactor into service in August. Nesterenko said that Clinton did not voice any concern over the project during the talks in Moscow. In 1995, Russia signed an agreement with Iran to build the plant. Under the deal, the plant was originally scheduled to be completed in 1999, but the completion of the $1 billion project has been frequently delayed. Nesterenko added that possible new sanctions on Iran over its nuclear program would not halt the start-up of the plant. "It would be wrong to make any links between the construction and the launch of the plant and the growing need to take new measures towards Tehran," AFP quoted the Russian official as saying on Thursday. Although the IAEA inspectors stationed in Iran have not been able to find any evidence to support US and European claims of diversion in the Iranian nuclear program, the Western allies continue to accuse Iran of pursuing nuclear military aims under the guise of a civilian program — a claim repeatedly rejected by Tehran. Iran is adamant that, as a signatory to the Nuclear Non-Proliferation Treaty, its nuclear program is peaceful and aimed at civilian applications of the technology which many Western countries enjoy but try to prevent other states to acquire. Sheehan, arrested at the end of the march, had earlier said, "We did lose some momentum when Obama came into office, but now we have younger people that are very energetic. They know we can change the world." 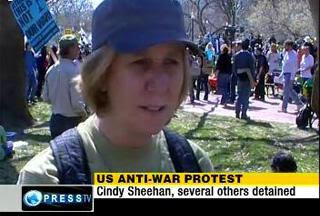 She gained repute as a peace activist in 2005 for protesting outside of Bush's Texas ranch. Brazilian president says the potential for concluding a Middle East peace deal requires the presence of Iran, Palestinian Hamas movement and Lebanon's Hezbollah at the negotiating table. 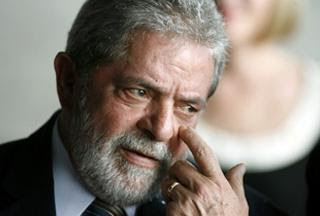 Speaking during a TV appearance, Luis Inacio Lula da Silva expressed support for "dialogue with the Iranians, with the Syrians, with Israel, with the Palestinians, with Hamas and with Hezbollah," AFP reported on Tuesday. "Everyone talks about the crisis in the Middle East, but no one is doing anything to fix it. Brazil is trying to do its part," he added. Speaking to the Israeli newspaper Haaretz earlier in the month, Lula highlighted Iran's role in the region, reiterating that Tehran must be part of a solution to any conflict in the Middle East. Tel Aviv refuses to meet the Palestinian conditions for resuming peace talks, which include a permanent and complete freeze on its illegal settlements construction in the occupied Palestinian territories. The resulting longstanding stalemate in the negotiations was compounded by Israel's December 2008-January 2009 offensives against the Gaza Strip, which claimed the lives of more than 1,400 Palestinians. Israel's spy agency, the Mossad, has been accused by authorities in the UAE of being involved in the killing of Mahmoud al-Mabhouh on January 20. 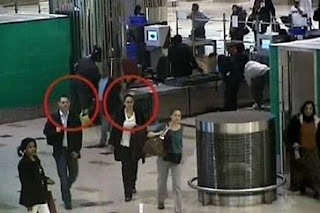 David Miliband, Britain's foreign secretary, was expected to make a statement later on Tuesday. Alan Fisher, Al Jazeera's correspondent in London said the move was "to show British displeasure". "The British are not making any suggestion at this stage that this was a Mossad operation ... but they are saying that the government knew about the cloned passports and that's why they're taking this action". Earlier Israel has confirmed that Ron Prosor, its ambassador to Britain, was called to London's foreign office on Monday for talks. Israel has neither confirmed nor denied involvement in al-Mabhouh's killing. The Israeli premier, in accordance with the regime's Iranophobia policy, has warned against Tehran's nuclear program, calling for 'swift and decisive' action on the Islamic Republic. 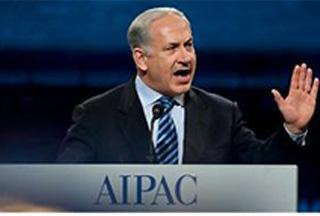 Speaking before representatives and senators at the top influential pro-Israel lobbying group, AIPAC, in Washington on Monday, Binyamin Netanyahu said that Tel Aviv expects "the international community to act swiftly and to act decisively to thwart this danger." He said that if Iran achieves the development of nuclear weapons, it would end the 65-year nuclear peace the world has known. This is while Iran, which unlike Israel is a signatory to the Nuclear Non-Proliferation Treaty (NPT), says its nuclear work is directed at the civilian applications of the technology and is not after nuclear weapons. However, Israel, the US and their allies accuse Tehran of pursuing a military objective in its nuclear program, despite affirmation by the International Atomic Energy Agency (IAEA) of Iran's non-diversion in its activities. Israel, reported to have the region's sole atomic arsenal, has a long-standing agenda to bomb Iran's nuclear sites, arguing that the country is a potential threat against the regime. 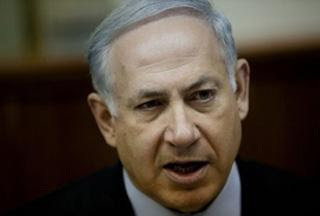 Plans for a military attack against Iran have gained momentum in Tel Aviv over the past few months. On November 7, Israeli Deputy Foreign Minister Danny Ayalon warned Iran that Tel Aviv's persistent threats of military action were not just bluff. Iran rejects US and Israeli allegations over its nuclear energy program as politically-motivated. Iran's nuclear program was launched in the 1950s with the help of the United States as part of the Atoms for Peace program. After the 1979 Revolution, which toppled Iran's US-backed monarch Mohammad Reza Pahlavi, Western companies working on Iran's nuclear program refused to fulfill their obligations even though they had been paid in full. Israeli Prime Minister Benjamin Netanyahu says that Jerusalem (al-Quds) is not a settlement, but Israel's capital, defying the international community over the thorny issue of settlement activity. He pointed out in Washington on Monday night that all Israeli administrations have built in Jerusalem (al-Quds). During the six-day war in 1967, Israel occupied and later annexed al-Quds in a move never recognized by the international community. In his speech, Netanyahu pushed back against American suggestions that Israel hadn't shown a commitment to peace. The comments come as Israel's interior ministry last week gave a green light to the construction of 1,600 new housing units in Ramat Shlomo neighborhood in the mainly Arab eastern sector of Jerusalem (al-Quds). Ironically, the announcement came during US Vice President Joe Biden's trip to Israel to revive the so-called peace process. The announcement drew severe criticism from Britain, China, Russia, Turkey, Iran, the United States and a number of other countries. The Judaization plan was described as "a slap in the face" Biden endured during his visit to Israel. The New York Times labeled Israel's decision to authorize 1,600 new housing units in East al-Quds "a new record for diplomatic stupidity." Settlement activity has been internationally described as the main obstacle in the way of the peace process between Israel and Palestinians. East al-Quds has long been demanded by Palestinians as the capital of their future state. Hundreds of Arabs, Muslims and British nationals have staged a rally in the center of London in condemnation of the visit by the mayor of Jerusalem (al-Quds) Nir Barkat to the British capital. 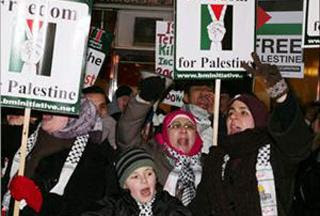 The protestors, numbering around 300, on Monday evening criticized the British government for Barkat's visit and urged authorities to arrest and prosecute him for violations against the indigenous Palestinian people living in the city of al-Quds, according to a report published by the International Middle East Media Center. The rally was organized by Palestine Solidarity Campaign, Stop the War Coalition, British Muslim Initiative, Jews for Justice for Palestinians, Friends of Lebanon, Friends of Sabeel UK, Architects and Planners for Justice in Palestine, and Palestinian Forum in the UK. Spokesperson of the Palestinian Forum in the UK, Ahmad al-Turk, said that protestors were angered by the British government's inviting of Barkat as a guest instead of prosecuting him for demolishing dozens of Palestinian and Arab homes in the Old City of al-Quds. Israel's interior ministry last week gave a green light to the construction of 1,600 new housing units in Ramat Shlomo neighborhood in the mainly Arab eastern sector of al-Quds. 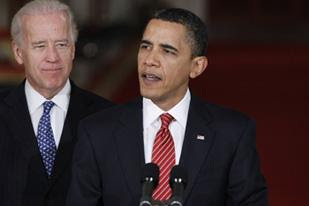 The announcement came during US Vice President Joe Biden's trip to Israel to revive the so-called peace process. It caused prospects for indirect Israeli-Palestinian talks to collapse and also sparked swift condemnation from Britain, China, Iran, Russia, Turkey, the United States and a number of other countries. Settlement activity has been internationally described as the main obstacle in the way of the peace process between Israel and Palestinians. East al-Quds is claimed by Palestinians as the capital of their future state. Google's decision to shut down its internet search site for mainland China and stop censoring search results is "totally wrong" and represents a politicisation of business issues, China has said. In an immediate and sharply critical response to Google's announcement, China said the California-based internet giant had "violated the written promise" it made when it entered the Chinese market. "We firmly oppose politicising commercial issues, and express our dissatisfaction and anger at Google Inc's unreasonable accusations and practices," the state-run Xinhua news agency quoted an unnamed official from China's State Council Information Office as saying. 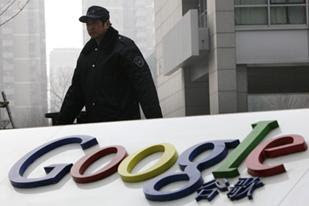 The backlash followed an announcement from Google on Monday that it was shutting down its China-based site, Google.cn, and redirecting search requests to Google's Hong Kong-based portal, Google.com.hk. On Tuesday Al Jazeera's own testing of the Google.com.hk site accessed from Beijing showed that while search terms such as "Tiananmen Square massacre" and "Tibet freedom" did yield results, the links themselves were not accessible. In January Google stunned many in the online world when it said it would stop filtering searches and threatened to pull out of China altogether after uncovering what it said were sophisticated cyber attacks against its systems and email accounts used by Chinese activists. 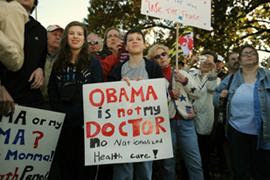 The US House of Representatives has passed a landmark bill overhauling the country's healthcare system, finally pushing through the top item on Barack Obama's domestic agenda. The US president praised legislators for passing the reform bill late on Sunday, saying he knew it was not an easy vote but calling it "the right vote". "Today's vote answers the prayers of every American who has hoped deeply for something to be done about a system that works for insurance companies, but not for ordinary people," Obama said at the White House just before midnight. "It's a victory for the American people and it's a victory for common sense," he added. Veteran liberal, citizens' rights campaigner and former US presidential candidate, Ralph Nader, has criticized Israel for possessing nuclear weapons and refusing to join the nuclear Non-Proliferation Treaty (NPT). 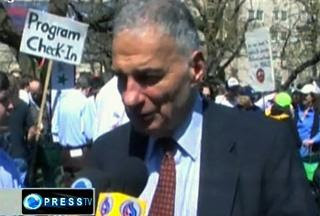 "Israel has 250 nuclear bombs and they don't belong to the Non-Proliferation Treaty, so they aren't even part of international law," Nader told Press TV during an anti-war demonstration in Washington DC on Saturday. Tel Aviv, which is widely believed to be the only nuclear-armed power in the Middle East, refuses access to its nuclear sites by the International Atomic Energy Agency (IAEA). According to May 2008 comments by former US President Jimmy Carter, Israel has 150 nuclear weapons in its arsenal. Nader further pointed to the contrast between the treatment Israel is receiving from its Western allies over its nuclear program and the pressure Iran is under for its civilian atomic activities. 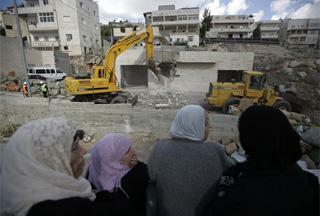 "Israel has invaded its neighbors repeatedly. 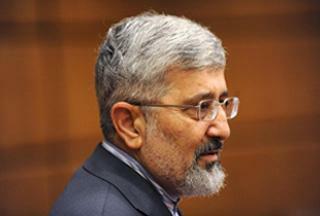 Iran hasn't invaded anybody in 250 years," he said. Under pressure from the US, Israel's closest ally, the UN Security Council has passed several rounds of sanctions against Iran over its nuclear program. This is while Tehran's is a signatory of the NPT and its nuclear activities are under the constant supervision of the IAEA. IAEA inspectors have conducted more inspections in Iran than in any other NPT signatory state, and have confirmed that there has been no diversion of nuclear material from civilian to military applications. Despite Tel Aviv's refusal to renounce nuclear and other weapons of mass destruction, Israel and its Western allies accuse Iran of seeking to develop nuclear weapons under the guise of a civilian program — a charge strongly denied by Tehran. Iran, a signatory to the Nuclear Non-Proliferation Treaty (NPT), views the claims as "unfounded and baseless” as the non-diversion of Iranian nuclear materials has been repeatedly verified in unannounced visits by UN inspectors. "The new [US] administration and president … wrote letters and sent messages ... saying they are willing to normalize relations with the Islamic Republic, but in practice they did the opposite," Leader of the Islamic Revolution Ayatollah Seyyed Ali Khamenei said Sunday in a Nowruz address to Iranians in the holy city of Mashhad. 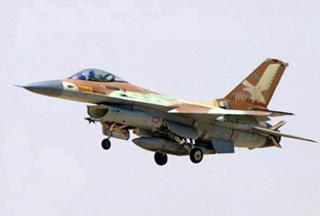 The Lebanese army says it has opened fire on two Israeli warplanes that were violating the country's airspace at medium altitude. "The army's anti-aircraft guns fired at two Israeli warplanes overflying Hasbaya in southeastern Lebanon," the Lebanese army said in statement late Sunday. Israel's regular overflights across southern Lebanon are in violation of the UN Security Council Resolution 1701, the statement added. The resolution calls on Tel Aviv to stop invading Lebanon's sovereignty by land, sea and air. Resolution 1701 was unanimously adopted by the UN Security Council in August 2006 that brought to end Israel's 33-day war on Lebanon, during which Israeli forces failed to achieve any of their objectives. The Sunday violation occurred amid Israel's escalating war threats in the region. 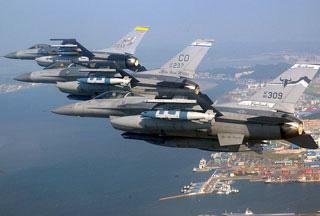 The army says Israeli warplanes have entered Lebanese airspace on an almost-daily basis during the past months. Nabil Sha'ath, a Fatah Central Committee member, says Palestinians cannot be dragged into violence despite an Israeli plan to provoke an armed conflict in the region. Sha'ath was speaking after a meeting with the Palestine Liberation Organization's Secretary General Yasser Abed Rabbo and leaders of Palestinian groups in Ramallah on Sunday. He added that there will be no return to peace talks with Israel until a full settlement freeze is upheld, Ma'an news agency reported. Pointing to the recent killing of four Palestinian teenagers in Nablus, Sha'ath said, "Israel is acting with obsession and insanity in its confrontation against the popular struggle in the territories." He added that people in the West Bank and the Gaza Strip were "alert" to avoid an armed conflict. Israel is trying to force such a confrontation to cover up its denial of Palestinians' rights, he said. US Mideast envoy George Mitchell is to meet acting Palestinian Authority chief Mahmoud Abbas on Monday in Amman, Jordan, where the acting Ramallah leadership will ask the US envoy about Washington's stance on Tel Aviv's plans to build a 1,600-unit settlement in East Jerusalem (al-Quds) and "possibly delaying the project for three years," Sha'ath said. Beijing has threatened to retaliate if the United States declares China a currency manipulator and imposes trade sanctions. The US Treasury is to rule whether China is unfairly holding down its exchange rate to gain a competitive edge in global markets. Political pressure is growing in Washington to declare China a currency manipulator. 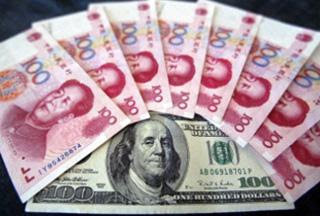 Some US senators have threatened to slap duties on Chinese products if Beijing fails to allow the yuan's value to rise. Washington says China holds the yuan low so that Chinese goods can enjoy an artificial competitive edge. Three years ago, Beijing had let the yuan climb 21 percent against the US dollar. The International Monetary Fund and the World Bank have both urged China to let the yuan resume its ascent. The currency debate has caused tension between the US and China. Relations between Beijing and Washington have been deteriorating over a number of issues, including the Pentagon's arms sales to Taiwan.